U.S. homes and businesses will likely use record amounts of natural gas for heating on Wednesday as an Arctic-like freeze blankets the eastern half of the country, according to energy analysts. That brutal cold could also temporarily reduce gas production by causing freeze-offs in the Marcellus and Utica shale, the nation's biggest gas producing region, in Pennsylvania, Ohio and West Virginia, the analysts warned. 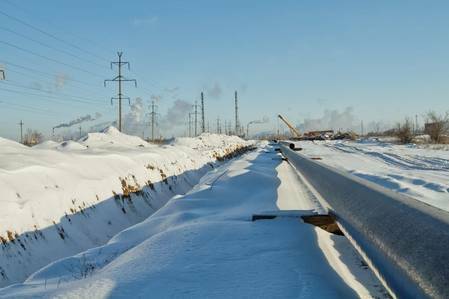 "Based on our analysis of historical freeze-offs, temperature conditions forecasted for Jan. 30-31 pose a risk of a freeze-off occurring in the Marcellus/Utica...in the ballpark of 1 bcfd," said Rishi Iyengar, senior analyst natural gas markets at IHS Markit's OPIS PointLogic. In early estimates, Marcellus/Utica production was down about 0.7 bcfd to 29.6 bcfd on Wednesday, according to Refinitiv. Iyengar said current forecasts were not cold enough to impact production in the Bakken shale in North Dakota because drillers there have invested in equipment needed to handle extremely low temperatures. In the spot market, next-day prices for Wednesday for power at PJM West in western Pennsylvania and gas in Chicago both rose to their highest in a year as demand for heating spiked. PJM, the electric grid operator for all or parts of 13 states from New Jersey to Illinois, forecast power demand would reach about 142,000 megawatts (MW) on Thursday, approaching the region's all-time winter peak of 143,295 MW on Feb. 20, 2015. PJM said it has "robust reserves and does not expect to have any capacity issues" in meeting demand. One megawatt can power about 1,000 homes.